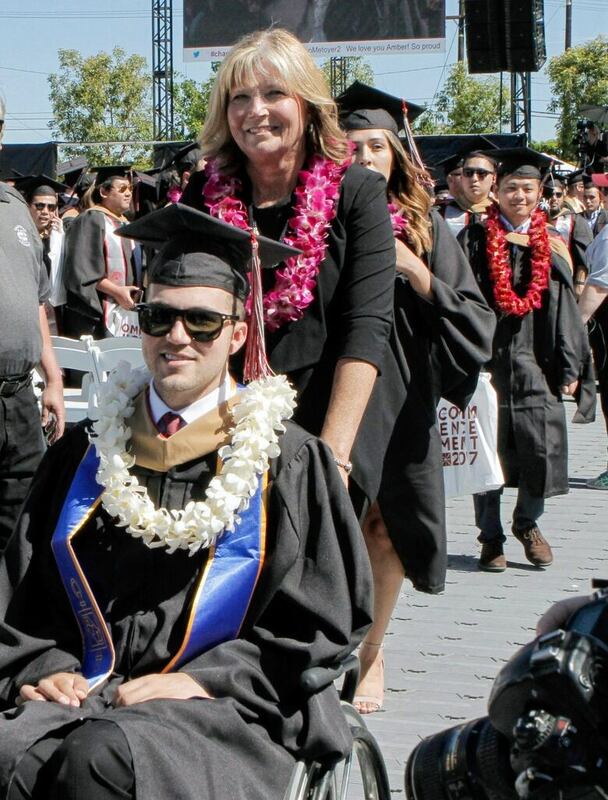 Marty O'Connor, a quadriplegic graduate, surprised his mother with her own honorary MBA degree after she spent two years with him at school taking his notes. For young students, going to university usually means leaving your childhood home and exploring your newfound freedom, without your parents. But for the past two years, Marty O'Connor went to every single class with his mother. In 2012, O'Connor got into an accident that left him paralyzed from the shoulders down. And when he decided to pursue a master's degree, his mom Judy had to help him take notes. 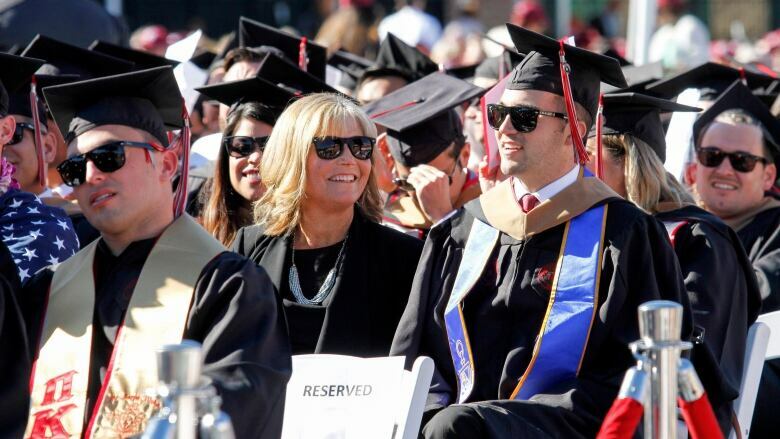 Last Saturday, O'Connor graduated from Chapman University in Orange, Calif., with a master's of business administration. But to his mother's surprise, she also left the ceremony with her own MBA degree. As It Happens host Carol Off spoke with Marty and Judy O'Connor to hear more about this special moment. Here is part of their conversation. Carol Off: Judy did you have any idea, any clue, that you were going to be getting this honorary MBA on Saturday? Judy O'Connor: I had no clue whatsoever. I was doing my best to get Marty pushed across the stage and in position to receive his diploma and take pictures and I was kind of trying to get in the background and all of a sudden the dean took my arm and I heard my name on the speaker and, oh my goodness, I was blown away. What a wonderful surprise. CO: Marty I understand it wasn't a surprise to you. You had a hand in this. Marty O'Connor: Oh absolutely. I had met with the president of the university months back. I wanted to take that opportunity to just make him aware of just what a big part of my success that she was. I took that opportunity to say I don't know what the process is but I formally want to nominate my mom for an honorary MBA because she was so deserving. She was there in the trenches with me throughout the whole process. It extended so far beyond what was just going on in the classroom, because an MBA program felt like a 24-hour job. CO: Marty, what are you going to do with this degree? MO: I plan to work for an actions sports and entertainment startup that was founded by my old college roommate. It's called Divertcity. They use the values you learn from action sports to help empower the individual, and then have the individual go back and help transform the community. It combines everything I love in action sports and philanthropy, and I just couldn't be happier. CO: And Judy what are you going to do? JO: Well I will continue to be Marty's caregiver. We also have a family foundation, the Marty O'Connor foundation for progress and I am going to up my game on fundraising and trying to make people aware of the need for spinal cord injury research. I mean this has been therapeutic for me as as a parent. When something like a spinal cord injury happens to your child there's no fixing it and you feel really helpless and angry and just don't know what to do. Being able to do this for my son was really rewarding for me and to see him create a new life after his injury has just been so rewarding to me. I'm so happy to be a part of it. CO: Judy, what were your thoughts and feelings as you saw him get his degree? JO: I was just absolutely bursting of pride because I knew how much he had gone through to get that degree and I just felt so wonderful because of the bright future that he has now after this horrible injury. CO: And Marty, your thoughts and feelings as you saw your mom get her honorary MBA? MO: It was amazing. It was just the culmination of two years of hard work, late nights and early mornings. The frustration, and the celebration from the good things. Like I said, she is just so deserving and to be able to see her get recognized, and then to see the crowd's reaction as well, it was just the most overwhelming moment of my life and I'm just so glad we could make that happen. This interview has been edited for length and clarity. For more on this story listen to our full conversation with Marty and Judy O'Connor.